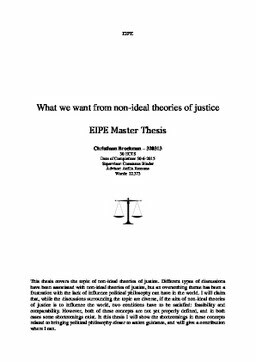 This thesis covers the topic of non-ideal theories of justice. Different types of discussions have been associated with non-ideal theories of justice, but an overarching theme has been a frustration with the lack of influence political philosophy can have in the world. I will claim that, while the discussions surrounding the topic are diverse, if the aim of non-ideal theories of justice is to influence the world, two conditions have to be satisfied: feasibility and comparability. However, both of these concepts are not yet properly defined, and in both cases some shortcomings exist. In this thesis I will show the shortcomings in these concepts related to bringing political philosophy closer to action guidance, and will give a contribution where I can.